Against the dusky blue backdrop a hawk spreads its wings and glides in sweeping figure-eights back and forth across the sky at the onset of twilight. The figure-eights revolve as if gliding along an unseen disk moving slowly in a circular pattern like the top of the CN Tower in Toronto or the Space Needle in Seattle. It’s a pattern so smooth – in perpetual motion like a gyroscope. The stars my father loved to look at, telling me about the stars, the planets. How they moved about. What they depicted. How far away they were and what they might signify. They spoke to him, drew him into discussions about astronomy, life, death. Where do we go? What happens after? A child’s smile. Some children don’t, and you are grateful yours do. So sad for the others, it sometimes makes you cry. You cry for happiness when yours smile, when they laugh, when they comfortably lean into your body as you tell them a story, asking questions, thinking of the characters in the stories as real people. Like them: worried sometimes, fearful, brave, happy, sad. We are all the same. None of us alone. A pile of clothes covers the bed. You’ve not worn them in forever and are giving them to someone you don’t even know who needs them. They will not be required to pay anything and the gift will be anonymous. You have washed and folded them neatly because it’s important and the doing of this will make the recipient(s) feel the importance you recognize they have to someone else. They will not be invisible, not to someone, not to you. A grandchild who feels wanted, whose life is cherished. A child who wants nothing more than to be wrapped in the comfort of your arms to watch television, to be read to, to be sung to, to be rocked to sleep in safety. To be acknowledged in any way as being loved and cared about. Too many are important to no one. An unusual bouquet of brittle, dead leaves that have lost their beautiful autumn colors because they were picked off the ground just before snow began to fall. You are careful to arrange them in a small vase so they don’t crumble to bits too soon. Your little one knows you love these pretty things, even if he’s not as discerning about which leaves it is you love. Here, he says, I picked these for you, Mommy. And you love them, love him, because he did. An adult child who has blossomed into the most beautiful flower. Who has overcome the most difficult obstacles set in her path at almost every turn. She has survived, more than survived. She has opened her petals in the warm face of the sun. Bright, beautiful colors reflect the light within her. She shines though she thinks herself a useless weed with nothing to offer the lovely, fragrant garden that surrounds her. A lost love, remembered and forever cherished for the ways in which his love helped you find your true self. With gifts of kindness, tenderness, intensity, and passion that knew who you were before you did. A friend who loves you as you are. Imperfect. Flawed. You can tell her anything. Every terrible thing you’ve ever thought, or done, and she will love you the same tomorrow as she does today. She will care. She will listen. She will be there when you need her, drop everything to listen, to help. To show you she cares. And you will do the same for her. Standing at the top of a snow-capped mountain in the Alps, awestruck by the stark, quiet beauty of the surrounding landscape, the crisp air, the height from which everything below you is there yet can’t be discerned because you are thousands of feet above it all. Walking along the lowest point of Death Valley, its unrelenting heat radiating in ephemeral waves off the sand dunes, the roads, the vistas, silent save for wind gusts that stir the sand and heat under a blistering sun. Unprotected skin burns in no time at all. You thirst. You can barely breathe in this insufferable clime. So beautiful it takes your breath away. You stand there to feel it, to think about it. You don’t want to leave. You want to return in the spring when it comes alive with desert blossoms. Guaranasia, Brazil. A place of love and laughter, of friendships both old and new made in several different languages, two of which you can communicate. The others you manage with hand gestures. So much fun. New experiences, new foods, altered landscapes. Parrots in the wild. Ant hills the size of small huts. Friendly, welcoming people in the town of a very close friend who is getting married that weekend. Different from any other place and wonderful in the best of ways. A place, and people, forever remembered. Driving alongside the Rhine. Ancient castles, long past the point of keeping hoards of inhospitable, plundering armies at bay, dot mountaintops along the river’s edge. Ancient towns with ancient histories. So much to be learned from yesterday. And today. Truly beautiful things are not to be hoped for in the dawn of a new year but rather in things given little if any thought in the course of a busy day. A tape recording thought lost. A beloved grandmother’s voice singing a Slovenian lullaby to her great-grandchildren. Her soft, lilting voice a comfort, a joy. Sorely missed, even after 41 years. Slow down. Take time. Remove those earplugs from your ears and stop talking, if only for a while. Allow quiet moments into your life. Moments to recognize, to think, to reflect. To relish what the smallest things have to offer. This entry was posted in On Family and Parenting, Quick Bites, Travel and tagged Life Stories, Parenting on January 18, 2016 by lindagwhite. We are living in a brave new world (not Huxley’s, though we’re coming closer to his) where things are changing so fast that we aren’t thinking clearly about the adjustments we should be making to maintain our connections to the people around us. This is nowhere more evident than at mealtime. 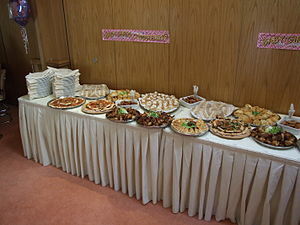 Is your repast enjoyed leisurely in friendship and with conversation – or is it scarfed down furtively because you don’t want to share that special doughnut or Hershey bar or because you don’t want anyone to know just how much you’re eating? Do you fail to make eye contact, staring at nothing but your plate, mumbling now and then in feigned interest? Or are you staring at something else entirely? Have your eating habits developed in response to time, or the perceived lack of it? These days people aren’t thinking much about what they’re eating and even less about whom they’re eating it with, if indeed they’re eating with anyone. We’re too busy and too rushed to spend time at the table with family, wasting time talking to each other. Just nuke a box of something in the microwave – leftovers in the fridge or the takeout that cooled in the car on the way home. Then eat it right out of the Tupperware, or maybe the Styrofoam or paper container it came in, or maybe scrape it onto a cheap paper plate and sit at the counter or stand by the sink. Shovel it in. Choke it down. Move on. Way too much time is wasted sitting down to a home-cooked meal. And even if you manage to do it, say once a week – and that’s asking a lot in some households what with all the activities kids are involved in these days), – the ensuing silence at the table can be deafening. Between bites, the individuals gathered there are playing games on their phones, reading things online, or texting friends. And make no mistake about it, this does not constitute a family meal because while they might inhabit the same room for a few brief moments, they are sitting in their individual bubbles completely disconnected from each other. The new, but not improved, version of time spent with family. We eat mindlessly – from microwave to mouth. In a rush standing at the sink. Zoned out in front of the television. With our eyes glued to our handy little smart phones, oblivious to others in the room if, indeed, there’s anyone even there. Who do you suppose is the “smart” one in these scenarios? Apple, et al. That’s who. And not only because we are in such a hurry these days but also because we eat much of the time like dogs, taking food in without spending time savoring it, it doesn’t matter how that food is served to us. Laura’s dog, Mojo, appears to open wide and swallow all in one motion sometimes! He’s so anxious to get something special, you’d think he’d want to taste it a little bit, even if only for a second or two. Why don’t we forget the china and grab something cheap and easy: everyday dishes, the hard plastic, non-breakable kind, or the easily disposable paper plate in a wide variety of strengths suitable for different kinds of meals. Best of all might be that old stand-by – the paper towel, folded over for greater strength and durability as your mouth hovers over the kitchen counter or sink where errant crumbs can fall directly into the disposal. And paper plates eliminate the need for hand-washing or running the dishwasher. If you’re forced to eat on china, you feel compelled, at least in a subliminal way, to sit down – and slow down. Then you almost have to look at the person next to, or across from, you at the table. To engage in conversation, though most people have forgotten how to do that as well – talking over top of each other vying for “top dog” status instead of taking turns. If we didn’t live in such a hurried world, we might be more inclined to make this time special and give it the importance it deserves. We might actually listen to what others have to say. But the more casual and less special we make things, the more casual and less important they become. Ergo, the less serious attention we give them. We sit at a restaurant, our ipads and smart phones in hand, never once looking up to make eye contact with parents, siblings, or friends; instead, picking at our food in silence because we just can’t tear ourselves away from our internet connections – even as we become more disconnected from those around us. I see this happening all the time, even with families with small children. Parents are looking at their phones or at the ipads they’ve propped up in front of them. Little kids have mini-computers and are playing games – taught, by example, that spending quality time with “things” is more important than spending quality time with people. Words have power, they speak to us – but sometimes silence speaks even louder. This entry was posted in On Family and Parenting, The Power of Words and tagged Aldous Huxley, Brave New World, Family, family meals, Meaningful Conversation, Parenting, Smart Phones, Technology and Communication on June 29, 2014 by lindagwhite. Celebrate Father’s Day? That’s not the word I would choose, but I do remember my father. I remember what he looked like, not as the old man he became but the one I knew in childhood and the one he grew into when I was in my 20s and 30s. He always seemed strong and confident, even in the wrongness he sometimes believed in. He was about 5’7” and very thin, but physically strong. Always doing something. I thought him handsome in a Humphrey Bogart sort of way. I loved him. 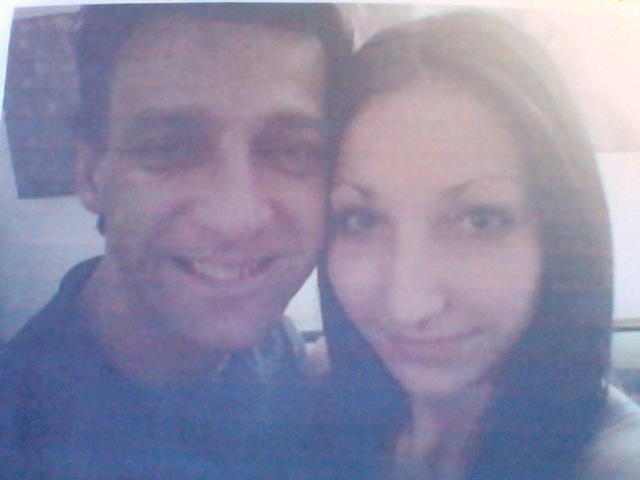 I remember how it felt to sit in his lap, one arm around me and the other holding up the newspaper so he could read it. I felt safe in his arms. When Dad was present in our lives, there but not there. I remember him asking me where Mom had hidden the money. He loved to gamble, and we sometimes went hungry when he fed his desires instead of his family. I remember the night he left us. I was standing in my bare feet beside my parents’ empty bed, watching my father wordlessly pull a couple of heavy cotton, gray workpants and a pair of faded jeans from the closet, bending their wire hangars in the process. They squeaked back and forth in the silence. Grabbing some underwear, socks, and several white cotton t-shirts from the drawer, he left my mother’s neatly folded slips untouched. Picking through a basket of dirty laundry in the corner behind the door, he removed three plaid, flannel shirts and stuffed them, and everything else, into a brown-paper, grocery sack now serving as his makeshift suitcase. I heard Mom’s panic rising in the straining timber of her voice as tears streamed down her cheeks. I remember seeing the woman he left us for sitting in his car. Waiting. I remember stopping for late night visits when I was older and having conversations with him about esoteric things: the universe, astronomy, the afterlife if there was one. He would ask how I was, sometimes how Mom was, but he often forgot to ask about my sisters or my children. But sometimes he was there. He would come infrequently in the middle of the night and wake me up to spend a few minutes with me. He didn’t know how devastated I was each time he left again or that I cried for days afterward. He was there to take photographs of Ronnie and me at the homecoming dance when I was in the 9th grade. I still have them. I look stiff and uncomfortable. When I put myself back there, back then, I realize I was, though I’m not sure why. But Dad was not there more than he was. He wasn’t there when I was chosen for the Major Work Class at the end of 4th grade. He didn’t know the fear that ruled my life after watching Bela Lagosi’s Dracula at the movies with Mom. He didn’t know that I was so unnerved by that experience that I became ill and for months was terrified to go to sleep at night. He wasn’t there for the music programs in the 5th and 6th grades in which I participated, nor was he there to help with or to see my 7th grade insect collection, how neatly the bugs I so feared were pinned and identified in tight rows on posterboard. He didn’t know how a super scaredy-cat like me could have accomplished this. He wasn’t there when I dissected a pig’s heart either and didn’t know I couldn’t choke down ham for almost a year after that. He didn’t know the thought of hot dogs made me sick to my stomach after I read Sinclair’s “The Jungle.” He didn’t know how much I liked to read, what I read, or what I thought about those stories. He didn’t know how much time I spent at the library. He wasn’t there for my high school graduation nor for the next two graduation ceremonies at the University. He didn’t know what kind of jobs I had. What kind of a mother I was, or wife. Who my friends were. He never knew how much I missed him, how much I needed him. How much I loved him. He didn’t know. He wasn’t there. He didn’t ask. I had a father – and I didn’t, and today I want to remember that, even if it’s not a cause for celebration. He was the only father I ever had, and he did have an impact on my life. I wonder how he’d feel about that. This entry was posted in On Family and Parenting and tagged Divorce, Family, Fathers Day, Life Stories, Parenting on June 15, 2014 by lindagwhite. She was weak before the accident and more severely weakened after it. The orthopedic surgeon said her arm was shattered and because she was an extremely high risk for surgery, he’d settled for Option #2 – putting her under for the 10 minutes it would take to reshape her arm and hold it in place while they cast it. It would not afford her the mobility she would otherwise have had, but she would have some use of it even if it didn’t work quite as it once did. There was a time when her hands did what she wanted them to do. When we were kids, Mom didn’t have a lot of free time, but on Sundays she played games with us. Our favorites were Sorry and Monopoly, one game sometimes taking an entire afternoon to play, and a card game called War – so fast-paced we played it over and over again. Sometimes Mom made popcorn on the stove, put it in a big bowl, and we’d eat it as we sat around the game board on the floor in the living room. When she was able to set aside a few extra dollars, she took us to a movie and bought us milkshakes at Isaly’s or took us to the park to play and swim. She was always busy cooking, cleaning, making our clothes, washing and ironing, keeping the shack we lived in as clean as possible, and making curtains for the scarred windows to make it look more like a real home. When my sister came home from school with lice in her hair, Sunday game time was put on hold, and Mom spent the entire afternoon and evening going through my sister’s long, thick, black hair, one hair at a time, picking out the nits. It was a painstaking process, but her fingers were deft then. They could do anything. But those same fingers that once pushed our clothes through a hand-wringer washing machine, now struggled to push the buttons through the buttonholes on her blouse. Her hands ironed my father’s work shirts for his shift at B&W, and later, after he left us with nothing, they ironed a bushel basket full of white dress shirts each week for the men of other wives with easier lives. Each bushel basket contained 20 damp shirts rolled up like newspapers. Twenty white dress shirts to be starched and wrinkle-free. A pristine job earned her $5 for the basketful. If the owner was dissatisfied with even one shirt – Mom got nothing for her efforts. Those same hands that made most of our clothes using material selected from the pile of remnants on the bargain basement table at Marshall’s in Barberton, now have difficulty pushing a button on the tv’s remote control because the arthritis in them is so bad. 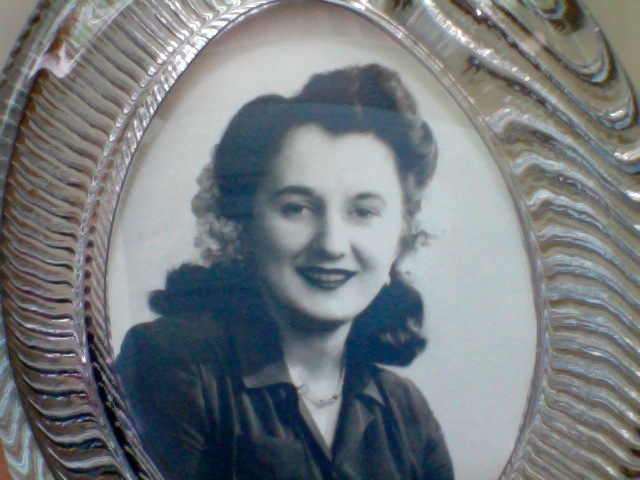 Mom’s hands have wallpapered, cooked, sewn, crocheted, and knitted for far more years than they haven’t. There is a picture of a flower-patterned, intricately crocheted tablecloth on top of a lamp table in front of which my sister and I are sitting when we were about 4 and 6 years old. Mom had placed a small Christmas tree on top of it, and Christmas icicles were dangling from it behind our heads as the photo was taken. Mom made that decorative piece the year before I was born – it now graces my own dining room table. Those hands that took care of us and did so many things with such ease falter now trying to push the nurse call button. They experience difficulty pushing her up from her chair or pulling a blanket over her in bed. She’s a little better after all the physical therapy, but not enough. She tries to lift her left arm so she can use her fingers to utilize the utensils she needs to cut and pick up her food, but it proves difficult. She tries again and it’s hard to watch her struggle and not jump in to help, but we are told not to. It is something she must do herself. The fiberglass cast stretching from her shoulder to just below the first knuckles of her fingers is too heavy to lift with her good arm which isn’t strong either. Her fingers shake as she attempts to grab those fingers on her other hand which are semi-contained by her cast. I want to cry. Her entire life has always been a struggle. She works hard to get strong enough to go home. All she wants to do is go home, but she will not have to do everything herself this time. We will extend our hands, returning the gift she gave us. We will take care of her now. This entry was posted in In the Spotlight, On Family and Parenting and tagged Family, Life Stories, Mothers Day, Parenting, Physical Therapy, The Elderly on May 11, 2014 by lindagwhite. Not everyone is cut out to be a parent. Some individuals just haven’t mastered the skill set needed to be someone others can rely on, sometimes through no fault of their own. And that’s one of the most vital things a parent must be – someone their child can rely on. It’s a gift not everyone has. 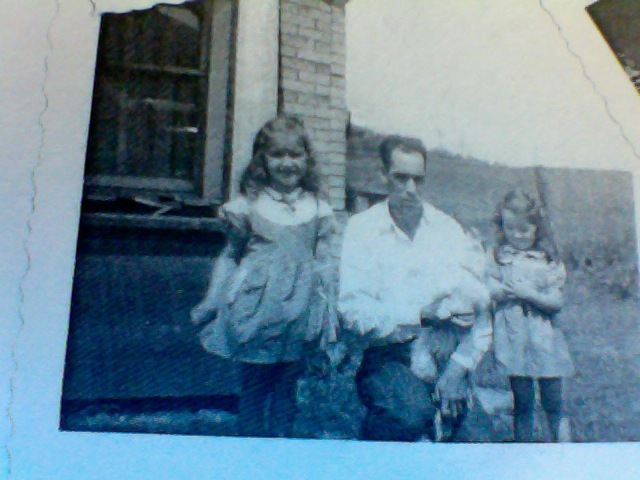 I have two half-sisters in Marietta whom I met but once when they were little girls. I suspect my father was a better parent to them than he was to my two sisters and me. But by the time they came along, he had the advantage of age and experience, perhaps a kind of maturity that he lacked when he was younger. Fatherhood might have been something he was able to grown into, given enough time. It didn’t work that way for us, though, and it took decades for me to realize that my mother had been trying to protect me, to keep me from being hurt by my father’s sporadic, infrequent, unannounced visits that left me crying for weeks afterward and watching for him at the window from one Saturday to the next. We never knew when, or even if, he’d be back, so she told him not to come at all if he couldn’t come regularly and at normal hours. It was painful for her to witness the aftermath of his visits. My youngest son, Jeff, is a father now. His daughter will soon be 21. He reminds me of my father in so many little ways it’s uncanny, though he only saw him a handful of times when he was just a little boy. Jeff’s appearance, mannerisms, some of the topics that interest him – a carbon copy of my dad – but with one significant difference. My dad gave up on us, his three little girls, after a while, allowing us to slip away from his life like fish that are too small to keep. He let us slide through his hands back into the water. But Jeff never gave up, even when Kearsti’s mother refused to let him spent much time with her the first years of her life. The courts were no help back then, so he was forced to fight for his little girl every step of the way. He fought to see her, to spend time with her, fought to keep her with him. And when her mother finally abandoned her on Jeff’s doorstep a few days before her 4th birthday, Jeff quickly filed for permanent and sole custody, overjoyed to finally get to be the father he wanted to be to the little girl he loved more than life itself. We all have something at which we excel, something that comes to us easily like drawing, carpentry, or negotiating with people to achieve positive outcomes. Being a good parent wasn’t one of them, either for my dad or Kearsti’s mother. Some of us don’t have the knack for it or had no role model (or the wrong one) to emulate. And some of us are immature and leave the raising of our offspring to someone else and turn our backs on our responsibilities, behaving like free agents. Some of us are afraid we won’t be good at it, and our fear gets in the way. Some parents grow into it gradually; for others, it doesn’t come at all. I believe that was the case with my own father. He grew up “dirt poor” in Kentucky’s Appalachia. One of six siblings, he didn’t always have shoes to wear or even the barest necessities. As a teenager, my dad was given to the mines, dropping out of school to work in filth and blackness under the constant threat of a cave-in to help support the family. He didn’t like it. Who would? He disliked being told what to do and having to spend his meager wages on things like rent and groceries. In my parents’ eighth year of marriage, he left us and, soon after, fathered two more girls with the woman he left us for. In his absence, I took to extolling his virtues and exalting the memory of the man I wanted him to be rather than recognizing the one that he was. He left me wanting, left my younger sister angry, and left my baby sister with no memory of him that survived into adulthood. He became the dream, the reflection in the mirror, the taillights on the car that just turned the corner up ahead and disappeared into the darkness beyond the last streetlamp. My dad didn’t try hard enough, at anything. He didn’t like having to work every day at the plant, and perhaps it took too much energy to be a parent, too. He never was the father I so needed him to be, and for years I manufactured excuses for the indifference I denied. Mom took on both parenting roles, a task that was far from easy for her, and she had to do it on her own because that’s how he left her. On her own. But no matter how difficult things were for her, she never let us slip back into the water – she never gave up. For much of my life, I’ve mourned the memory of a father who never existed. Not for us at least. Maybe he just didn’t know how then, but we suffered for that. Even as I reached adulthood, it never seemed possible to have an honest and personal conversation with my father, and I regret that I never did. Perhaps I didn’t try hard enough myself, afraid that what he would say might hurt me even more than his middle-of-the-night visits. I don’t even know if he missed me. While my son may look like his grandfather and have inherited some of his mannerisms, that’s where the resemblance ends. Jeff never stopped trying. Never stopped fighting for his little girl. Never stopped trying to be the best father he could be. I’m certain my father’s last two girls wished him a Happy Father’s Day all those years he was absent from my life, but I’ve saved my wishes for two father figures who earned them the hard way. Happy Father’s Day, Jeff. You never stopped trying, and I hope Kearsti appreciates how much you’ve loved her since the day she was born. And Happy Father’s Day to you, Mom, because you had to be both father and mother to us, and I can now appreciate just how difficult that was. This entry was posted in In the Spotlight, On Family and Parenting, The Power of Words and tagged Family, Fathers Day, Parenting on June 16, 2013 by lindagwhite. The powerful love that sweeps over you when your child is born is an amazing thing. Even years afterward, you can be overwhelmed with emotion at the oddest times. A slight inflection in their voice, a look in their eye, a unique point of view they casually toss out for discussion, the arrival of unexpected flowers, a card for no special occasion with a hand-written expression of their feelings for you, a laugh shared, or an unanticipated moment together can reduce a mother to tears of exquisite joy. I just want to protect you, you tell them, and they say they don’t need protecting anymore. But you made a promise when they were born. You held them in your arms and promised to be there for them, always – no matter what. You promise yourself, and them, that you will do your best. You will hold their hand, assuring their safe passage to the other side of the street, that you will always be by their side. But we’re inadequately prepared for motherhood. We learn by doing, giving the dice our best shake and tossing them into the world beyond our front doors. We don’t all come up with the same numbers, but we try to do the best we can. If one thing doesn’t work, we try something else, but mothers are human, like everyone else, and sometimes we make mistakes. Sometimes good things happen, but sometimes things go wrong. There is nothing worse than something bad happening to your child. Nothing. Your first inclination is to help, to save them from their mistakes. It doesn’t matter if they are five years old or fifty, the inclination remains the same. A mother’s pain doesn’t recognize the difference in age as more or less deserving of her attention. When a child is born and the mother holds her baby in her arms for the first time, she promises to be there – no matter what – to laugh and to cry with her, to share in his happiness, to stand by her side. A mother doesn’t run when something bad happens. She turns neither her face nor her heart away. A mother squares her shoulders and offers them to her child for solace, for strength. No matter what. That’s a mother’s promise. Looking back, I see my own mother battered by life from the day she was born. Harshly treated by her father, betrayed by the first man she loved, and physically beaten and publicly humiliated by the one she tried her hardest to please. As a child, I was vulnerable to her shifting moods. What I didn’t realize then was that she was just as vulnerable to mine – often more so. Her life has always been a struggle for survival built on the shifting sand of others’ caprice. Some of us idolize our mothers, refusing to acknowledge the faults we know they have. We are all human, we all have faults. But we can still have love. Others hate their mothers for not being like other mothers, showcase moms. They blame them for failings so similar to their own. We make assumptions, knowing so little about their inner lives or the hopes and dreams they had before we came along. We don’t know the secrets, the backstory, that fashioned who they are. To love a mother fully, you need to see her real face. Take a good look at her and accept all that she is. For she is not some ideal of perfection placed on a pedestal to be admired and worshipped from afar on one day of the year. She is a woman, at times fragile, at times strong. A woman like any other who sometimes chooses wrongly, says things she regrets in the heat of anger, frustration, or pain of her own, a woman and mother who shows she loves you in so many little ways every day. Mothers cry themselves to sleep at night when their children are in emotional pain, and they love without judging, they love unconditionally. My maternal grandmother showed me by example what it meant to be strong and taught me to stand tall, to face adversity head on. She told me I could do or be whatever I wanted. And though she had been cruelly denied those options herself, she never allowed the severe abuse she suffered at the hands of her own parents, for the crime of being born, to stand in her way. My own mother I have not always understood. My mother who deserved a better daughter than the one I gave her in those moments when she needed me most. She loved me anyway, unequivocally. My mother, injured by the harshness of her early years in the care of abusive grandparents, worked hard, clawing her way through life to overcome the disadvantaged beginning that scarred it. Through it all she managed to keep my sisters and me with her instead of shipping us out to foster homes as others told her to do, taking what meager jobs she could find to make sure we had food to eat. My mother, beaten down by a life far from beautiful, happy, or easy, was strong when she had to be in the ways that counted, though I’m ashamed to say I couldn’t see that as clearly then as I do now. We haven’t always gotten along as we should have. Haven’t always enjoyed each other’s company. We didn’t walk in the park for no reason. Didn’t go window-shopping. Didn’t write much to each other. Didn’t talk things out. We didn’t say I wish, I want. Didn’t say Help me, I’m sorry, Forgive me. Not until much later in life. And though I felt cheated for far too many years, she was the one who was. She couldn’t give me what she didn’t have and hadn’t been given – but she was what she had to be and did what she had to do when it counted the most. When it was needed for the sake of her three little girls. She wanted us to have a better life than she had. She wanted to protect us and held our hands as we crossed the street. She was there, every day of our lives, just as she promised she would be when we were born. This is for the mother I didn’t know I always had: Happy Mother’s Day, Mom. I love you more than ever. Call your mom today – tell her you love her. Tell her again. Give her the gift of yourself and time spent in her company. It’s the only gift she wants – the only one that matters. This entry was posted in In the Spotlight, On Family and Parenting, The Power of Words and tagged Anil's Ghost, Family, Micheal Ondaatjie, Mothers Day, Parenting, Virginia Woolf on May 12, 2013 by lindagwhite.